Rumor: Khalil Mack on the block? My analysis of this situation is they don't want to pay Mack the $65m in guarantees he wants and it's the same situation as the Steelers with Le'Veon Bell. They don't want to pay Mack what he values himself at and we don't want to pay Bell what he values himself at so let's make a deal. The addition of Samuels and having Conner is a Bill Belichick approach of replacing Le'Veon Bell. I think that replaces him. Samuels is excellent out of the backfield. He's faster than Bell and is arguably a better pass receiver out of the backfield who is adept at making tough contested catches. 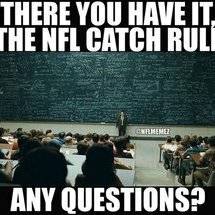 That means the easy catches are that much easier. Conner gives me a little vision and power run game. Bell is vastly overrated as a runner and is a beneficiary of the trench work and grooming done by Mike Munchak. This guy could run a pet grooming salon and get business. I look at the Raiders roster and they tried to improve the pass rush via the draft getting PJ Hall NT, Arden Key DE, and Maurice Hurst DT. They might be interested in turnover at this EDGE position like they did at Wide Receiver. Maybe they drafted pass rush because they were weak to begin with a contract dispute with Khalil Mack looming and Mack might be out the door like an Atlanta Falcons situation with Julio Jones. Sometimes you do this as a buffer for negotiation and sometimes this guy is really out the door. It would also be gitchy for the Raiders to get Bryant and Bell in two trades. Jon Gruden loves Le'Veon Bell. And I base that off of the numerous times he was spoken highly of him on Monday Night Football. And this wasn't noise. The reason I think the Raiders do this trade is because they swap a little at EDGE where they just improved their entire DL and bring in a piece that can help the rush offense and passing game. They didn't get much production out of this position last year and Derek Carr regressed as a quarterback, his turnovers increased, because he had to do more leading of the offense. Give this man some crutches so he can flat out ball. Bell is the perfect fit in Oakland. I don't know why they think it's a good idea for a power run RB in Marshawn Lynch when they run a spread scheme. Bell fits their spread scheme and can also run out of 1 back or the I-Form. I liken the EDGE guys today as like your NHL defenseman. I might be willing to go from a top line guy in Mack and exchange this for a #4-#5 guy in Dupree while bringing in a top flight winger that can help us put up more points on the scoreboard. The reason the Steelers do this as they address the elephant in the room. The pass rush. When interior DL lead your team in sacks you got problems. Probably half coverage sacks and half beast mode for Heyward. If the coverage breaks down, you lose your coverage sacks. When your two 1st rd OLB picks have combined in terms of sacks (13) what an elite OLB gets by himself you got problems. I'm looking at every team's depth chart and it seems like every team in the league has at least guy that can consistently get there. Keion Adams in the back pocket and belief in Bud Dupree is foolish. Hey I like Adams as a prospect but expecting much production out of Adams and Dupree as a solution is a bad move. I do this trade because let's get these drama queens out of here. Bring your lunch pail to work and start working hard. When I look at our defense, the defense gets so much better adding Khalil Mack as a 3-4 OLB and also putting his hand in the dirt in sub package. I'm looking at Mack-Heyward-Tuitt-Watt as my defensive line in sub package that will consistently get pressure on a QB all day long. Edmunds, Burnett, Allen give us a few nickel ILB options and with Hilton on the blitz and the coverage we already have in place I think this can be a top 5 defense. While still having a top 10 offense. Bottom line. I'm willing to lose a little on offense to make the defense that much better. So, trade for the identical problem. I don't get it. I think the Raiders would be dumb to do that but if we could get one of the premier pass rushers in the league for a disgruntled RB and a underachieving OLB, I’m for it. Gruden likes Bell but I think Mack is overrated, good player but overrated. Bell isn't overrated, but wants too much cap space. We're trading our problem for their problem? And we can't afford Bell at his price; how can we afford someone worth much more. I would consider it. Pass rushers are worth much more than RBs. I would pay one of the best pass rushers that kind of money. Not a RB. I think a player like Mack takes this team to another level. It wont happen, but I would certainly consider it. Us drafting the FB might be preparing for a traditional future instead of the super back Bell. So, why not try the Mack trade then, Money for FO! How does the option contract for the RD1 pick affect trading him? Actually, we COULD afford Bell. Its not that we CANT afford Bell, its that they dont want to pay a 26 year old RB whose proven he isnt that bright $17m a year. Sure it would be tight, but they would just keep moving money around and restructuring....for better or worse. Mack plays a much more important position....one that could completely transform our defense. This will never happen so Im not going to get into a debate about it....but a) I would do this deal in a freaking heartbeat and b) would be much much much more inclined to pay Mack $18-20m a year than paying Bell $17m a year.